Happy Friday Fitness Friends! I have seen Five Things Friday posts on some of my favorite blogs, and I wanted to join in the fun on this beautiful day. I would love to hear what 5 things are on your list this fab Friday. These are not all fitness related, but what the heck, I wanted to share anyway. I also have a love for fashion! I got these super cute sandals for a steal at DSW today. Kind of a funny story actually, my friend Kim and I went out for a girls night and traded shoes (mine were killing my feet!) and she ended up wearing mine home. Her and her fiance just rescued a new dog and he decided they looked like a good chew toy! She gave me a gift card for DSW which led me to this great find! I think I can squeeze a few weeks out of these bad boys before I have to put them away until Spring. With the money left over on my gc I saw these awesome fall colors at the register (they get me every time!) and I just had to snag these to pain my nails for the weekend. Ariana, my mom and I are headed to see my brother and sis-in law (who is preggers with my first niece or nephew) this weekend and I wanted to have fresh polish! I never do my nails anymore and it felt like a nice treat. These are colors I will use all season long. Since, Ariana is growing like a weed these days we needed to do some fall shopping for her today. My mom told me there was 40% off all kid stuff at Old Navy so after DSW, this was our next stop. I got a ton of super cute stuff for her, she is going to be a little fashionista (although I am sure she could care less right now, but will thank me later). While I was there I decided to peruse though stuff for me, and one of my finds was this super cute and lightweight sweatshirt. It is so comfy and will look cute with a tank and jeans. There were others with little saying, but I loved this one, its a reminder to live with your heart and soul! Activewear.com posted these on their Facebook page and I just had to order them! There was a 10% off your first order on the site, which paid for shipping, so I thought I'd try them out. 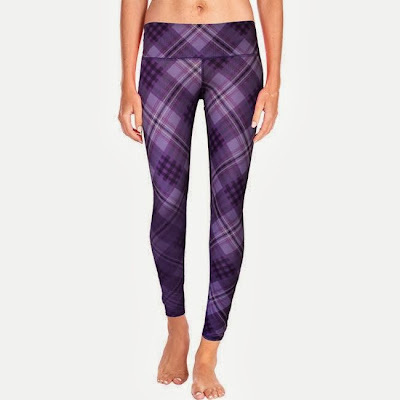 I know I workout by myself at home, but I thought if I ever get back to my yoga practice these would look cute and be comfy! You may catch me wearing them out and about, but hey that is one of the advantages of being a stay at home mom, Ariana doesn't care if I spend the day in yoga leggings. I also found a super cute back and grey pair at Old Navy, what can I say... I am a sucker for cute workout clothes! I am so blessed that I get to stay home and take care of our precious daughter. She is growing up so fast and learning so much and I get to be here to experience it all. She was quite the trooper during our shopping trip today and fell asleep on the way home. She is so much fun and has her own (strong willed) personality. I thank God for her every single day. She is the reason I keep myself active and healthy. I want her to grow up with a good role model, not have body image issues, eating the right foods (or at least knowing the right way to eat), and staying active. I want to be here for my grand kids (yea, I know I'm getting ahead of myself here), so I will take good care of myself so I am here for her! I am going to ACTIVEWEAR.COM right now!! I am obsessing over those leggings!!! :) I wonder if they will look as they do on the model, on me! HA HA HA! I know they are so cute! I can't wait to get mine!